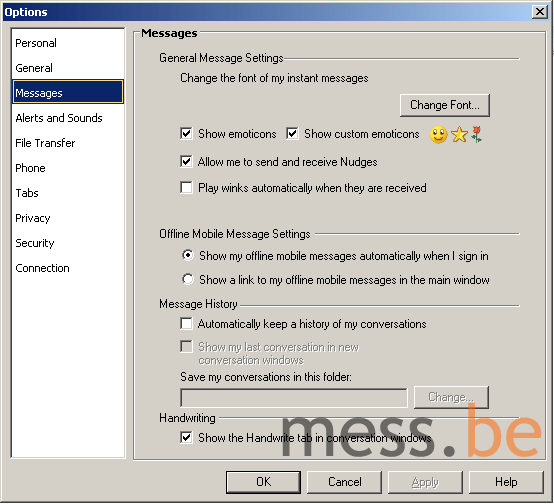 Updated: Mess Patch for MSN Messenger 7.0.0813, now 41 options! 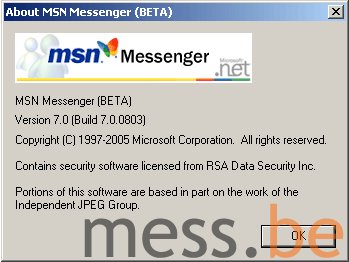 Given the leak of the QFE Patch today, which officially upgrades MSN Messenger 7.0.0777 to 7.0.0813, a reasonable number of users will have updated to that version by now. Especially for them, Rolando has worked very hard to release a new Mess Patch. But others might even want to consider updating to the new build, just to try the multitude of new options that come with this Mess Patch! ;-) If you're not downloading it right away, then let's see if the changelog can convince you! - Added "Remove Billing Information Menus" option (Removes both "Billing Information" and "Get More From Messenger" menus). 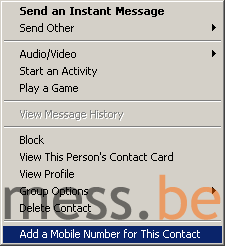 - *HOT* Added "Disable MSN Spaces Integration In Contact Cards" option. - Re-added "Enable Multi-line Nicknames" option. - Re-added "Add Sign-In Status In Systray Menu" option. - Added "Remove Gleams" option. - *HOT* Added "Disable Song Links" option (removes MSN Music search window). - Added "Add Always On Top Button" option for the main and conversation window. - Re-added "Remove User Is Typing Message" option (upon popular request ). - Now using MessengerAmpv2.1 plugin for Winamp by Barry Haanstra for Personal Messages. - *HOT* Re-enabled Title/Artist swapping for ALL audio players (Windows Media Player, Winamp and iTunes). - Added "Hide Personal Messages In Contact List" option. - Added "Remove Webcam Icon From To: Bar" option. - New Korean language support! Translation by Braun. - Divided options in three categories instead of two (new "General Options" page. That brings the total count of MSN Messenger tweaks to 41. BELIEVE! >> Download Mess Patch for MSN Messenger 7.0.0813. Messer Larney gave us the chance to take a sneak peek at another internal MSN Messenger 7 BETA, namely build 803 (view screenshot). 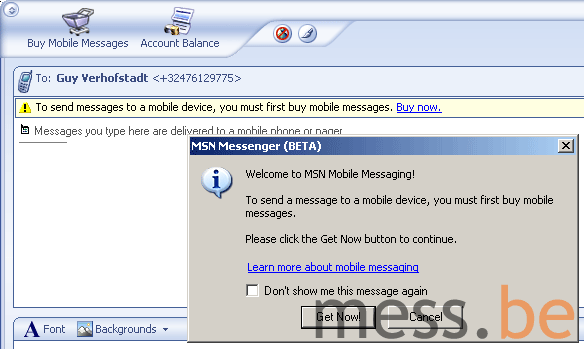 This build introduces the MSN Mobile Messaging feature (view screenshot) that utilises SMS technology to transmit short text messages to and from a mobile phone. With this feature, you can communicate with a "Mobile" friend by adding a mobile phone number to an existing contact (view screenshot), or even if his/her mobile phone does not have a MSN subscription or a Messenger client installed (view screenshot A, screenshot B and screenshot C). MSN Mobile Messaging is not a free service. Customers need to purchase credits prior to sending SMS messages from MSN Messenger (view screenshot). Via a secured website, you can buy packages of SMS messages for €3.99 per 25 messages (view screenshot). Credits stored in the Microsoft billing system under your Passport account. Also be aware that the person replying from their mobile phone to your SMS will be charged by their mobile service provider. Download.com bans adware, Messenger Plus! CNET Download.com, the world's most popular download site, on Thursday banned all software titles bundled with adware. The step was taken based on visitor's letters, user reviews, and polls, which all showed a strong disliking towards software bundled with adware. Our own CustoMess software for MSN Messenger 7 is, of course, still available at CNET Download.com because it really is free and free of crap. 1) Go here using Internet Explorer (!) and select Emoticons (some nice ones there), Display Pictures, Creaticons (MSN Display Pictures with your own custom text) or Backgrounds (or click any of the more... buttons). 2) Click the image or set of your choice and then choose Premium SMS as your payment option. 4) Your chosen content will automatically be installed into MSN Messenger 7! Of course, the fantastic content in our CustoMess software is also freely available and you don't even have to cheat to get it! According to numerous reports, multiple sources have leaked the MSN Messenger QFE Patch announced earlier today. The patch updates your MSN Messenger 7.0.0777 (the public release version) to build 0813 and along with several bug fixes it improves general performance and stability. Oh yeah, and starting with this version previously blocked file extensions .jpg and .mp3 are now available for transfer again. NOTE: The QFE Patch is still in BETA, so use it at your own risk. >> Sign up for the Mess.be News Alerts (delivered to MSN Messenger, e-mail or a mobile device). For the first time in history, the MSN Messenger team is working on a QFE (or "hotfix") patch to the current build of MSN Messenger (0777). QFE stands for Quick Fix Engineering, which means upgrading (to build 0813) through a small patch instead of a 7mb setup file like we're used to. In the past, many smallband users have complained about having to download entire versions just to upgrade. It seems that Microsoft is planning to address this complaint and, who knows, maybe MSN Messenger updates will finally be delivered through Windows Update (or like Phillllllllll reported, the upcoming Microsoft Update) in the future. The patch, currently available strictly to a handful of official BETA-testers, fixes a few bugs (eg. the "Always Sign On As:" bug). In general, BETA-testers have witnessed a faster and smoother overall performance (eg. during the sign-in process) after applying the patch. The QFE patch to 7.0.0777 is expected to be released to the public in a matter of hours, maybe days, as soon as it's been thoroughly tested. Unless someone leaks it, that is. UPDATE: Strangely enough, some common and annoying bugs (unlimited nudges, anyone?) are not fixed by the current version of the QFE patch. The latest MSN Messenger virus with variations as numerous as straight-to-video movies starring Stephen Baldwin, is the Kelvir worm. This fella usually spreads itself via automated instant messages inviting you to click a link that ends with the e-mail address you're using to log into MSN Messenger, I'm sure you know what I'm talking about. The most recent one, Kelvir.AO, takes advantage of the world's obsession with this skinny blonde called Paris Hilton and her notorious sexual orientation. Anywho, Symantec's W32.Kelvir Removal Tool got updated and now succesfully removes the infections of W32.Kelvir.D, W32.Kelvir.R, W32.Kelvir.S, W32.Kelvir.T, W32.Kelvir.W, W32.Kelvir.AC, W32.Kelvir.AE and W32.Kelvir.AF. Download it here. After a couple of hickups during the last couple of days, our FREE MSN Emoticons, MSN Display Pictures and MSN Backgrounds download service, CustoMess, is available 24/7 again (if I'm wrong, give me a holler). >> Download CustoMess for absolutely free MSN Messenger 7 content! Requires: MSN Messenger 7, the VB6 Runtimes and Macromedia Flash 7 (which you all probably own already). The sharp-eyed among you will have already noticed the shiny new sign in/out buttons here and there, demonstrating the upcoming complete makeover of Microsoft's cross-service .NET Passport. 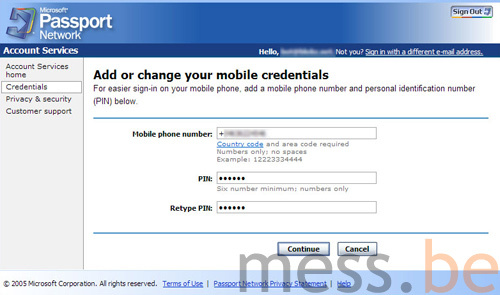 The new version 3.0, now dubbed Microsoft Passport Network, is expected to show improvements in both security (eg. a built-in password-strength test) and user-friendliness. >> View "Create a security key" (for strong-credential sign-in). >> View "Add or change your Mobile credentials" (probably not linked to MSN Messenger 7's Offline/Mobile Messaging feature). >> Browse our Passport-related FAQs. UPDATE: In case you want to play around a bit yourself, here's a live preview of the brand new Passport environment. Note that this version should not be considered fully operational. UPDATE 2: According to Matthew Weyer you can also sign into Passport with your phone number, followed by @passport.com, and your PIN. Matthew also confirmed the version number. Another modification had to be made to the Mess Forum, the free CustoMess service and the wonderful Custom MSN Messenger Games. Some of you might get a blank page when trying to access any of these, but that should be history within now and 24 hours! Again, we're sawwwrrry! >> Natalie Imbruglia MSN Display Pics. >> Nicole Richie MSN Display Pics. >> Olivia Wilde MSN Display Pics. >> Jessica Simpson MSN Display Pics. 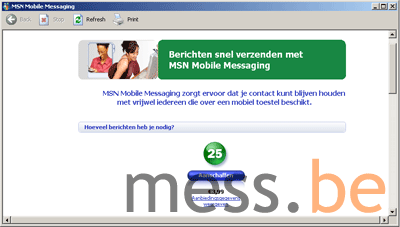 >> Mess.be Logo MSN Display Pics. >> Or browse all 23493 MSN Display Pictures. At Last: 2nd Display Picture Competition Winners! Big winner, for the second time in a row, is lpchick with a crazy 3713 "Mess.be-tagged-&-uploaded" MSN Display Pictures. She can go Amazon.com shopping with a shiny $150 US voucher. But don't worry folks, to give others a fair chance this half-female, half-Display Picture-generator is now automatically deprived from winning the first price in the next contest. The second prize, $100 US worth of Amazon.com products, goes to pHr0sTbYt3 as a big thank you for his 811 submitted MSN Display Pics. And there's enough for everyone at Amazon, so we're handing over $50 US gift certificates to both soj and realitylpma. Finally, some fine clothing for the runners-up: Baulie will soon be the proud owner of a Old School Hoody, and Sr_Colgao, amell and kamahlitude will each receive a funky Splitreason Beanie. Ok, that's it, we're out of prizes. A big thank you to the dozens of participants in our 2nd MSN Display Picture competition and keep watching this space for the rules & information on the 3rd one!